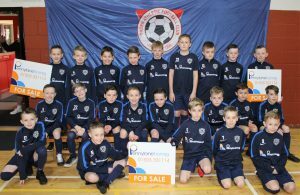 THORN ATHLETIC 2008s know it’s better to be in for a Penny than in for a pound after getting top Estate and Letting agents Penny Lane Homes on board as sponsors. The well-known West of Scotland wide company, established in 2004, have just supported the team with the purchase of new Nike training kits and jumpers for the season ahead. Penny Lane Homes have Branches in Johnstone, Renfrew, Paisley and Shawlands and are delighted to be getting behind one of the town’s local teams. Helen Canning, Director of Penny Lane Homes in Johnstone, said: “It’s great to be able to invest in our local community, particularly to help the sporting and physical development of such a dedicated and hard working group of talented young players. “We know the role that the business community plays is vital, in helping community and voluntary organisations and we are delighted to be in a position to help. And 2008 team secretary Paul Reid said: “We are very grateful to Penny Lane Homes for this significant sponsorship deal which allowed us to purchase a fantastic amount of kit for the players.